A speleothem based on calcite, which changes its axis from the vertical at one or more stages of its growth. Helictites have a curving or angular form that looks like they had grown in zero gravity. Helictites are composed of calcite, dripstone or flowstone. This clacite is deposited when water looses the ability to keep the limetsone soluted, which in general is because of the loss of carbon dioxide. As water drips from the ceiling and hits the floor, it forms vertical stalactites and stalagmites. When water stand still in a cave lake it forms rims, dams and crusts. 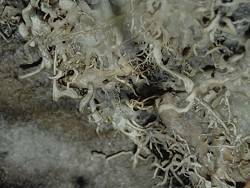 Helictites differ from all those forms of speleothems. They look similar to small stalactites and soda straws, but with a flaw. They are twisted and torn. Some look like horizontal stalactites, some are bent like a corkscrew. The growth of helictites is still very enigmatic. Until now there is absolutely no theory which really explains how they are formed, just a bunch of hypothesises. The main ideas are wind and capillary forces which both influence the direction of growth. At the moment it looks like there are different helictites formed by different mechanisms or a combination thereof. The most important mechanism in the forming of helictites are capillary forces. If the helictite has a very thin central tube where the water flows like in straws, capillary forces would be able to transport water ignoring gravity. Normal straws have too thick holes, capillary forces work much better with very narrow cracks or capillars. This theory was inspired by some hollow helictites. The problem with this theory is, that most helictites are definitely not hollow. Another theory names the wind in the cave as main reason for the strange look. Drops hanging on a stalactite are blown to one side, so the dripstone grows into this direction. If the wind changes, the direction of growth changes too. This theory is very problematic, because wind directions change very often. The wind in caves depends on air pressure changes outside, which are depending on the weather (see Wind Cave). So the wind direction changes as often as the weather conditions outside change. But the dripstones grow very slowly, a few centimeters in 100 years. So the direction would change every fragment of a milimetre. To form a corkscrew with a diameter of 10 centimeters the wind has to change its direction almost continually and very slowly for ten thousands of years. A second problem with this theory is, that many caves with helictites never had a natural entrance, and as a result never had wind. 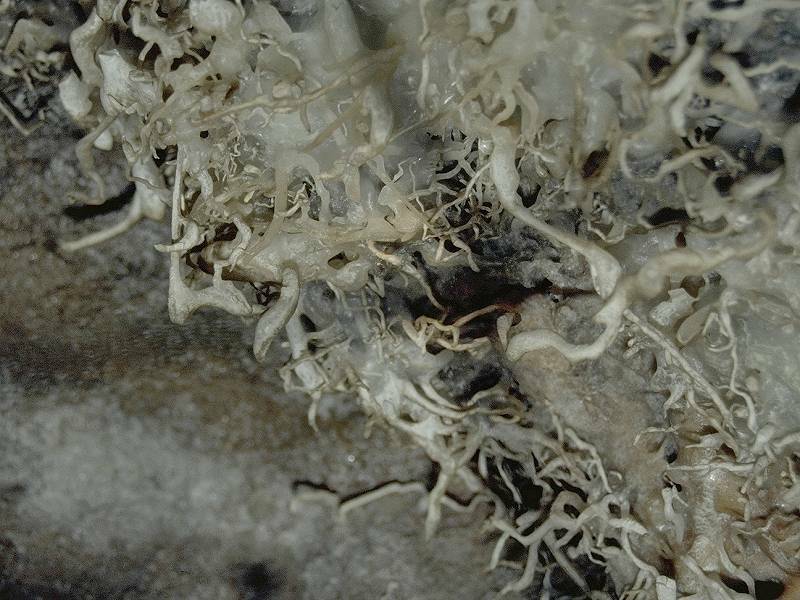 Helictites are often found in remote parts of caves, where no wind at all can be found, but wind strong enough to move water drops is easily detected. And finally there is the problem that many helictites grow horizontally out of the wall. Where should the wind come from to create this? The way helictites are really formed is still unknown. This is definitely the most enigmatic and interesting problem in speleology.